ALPENA, Mich. – Oklahoma's Edwin Evers was lost in deep thought, his face barely illuminated by the pre-dawn glow of boat electronics. That was understandable, since he was sitting in his boat while he searched the electronic map of Long Lake, hoping to find some bass catching clues about the Alpena water body. If E-2 could do that, and be one of the first three anglers to catch 40 pounds to survive Sudden Death Day Two of the 2014 Summit Cup, he would be in position to do what no man has ever done in the building history of Jack Link's Major League Fishing. And that would be to win a second MLF crown. Interrupting his pre-launch thoughts, I asked Evers a series of questions. 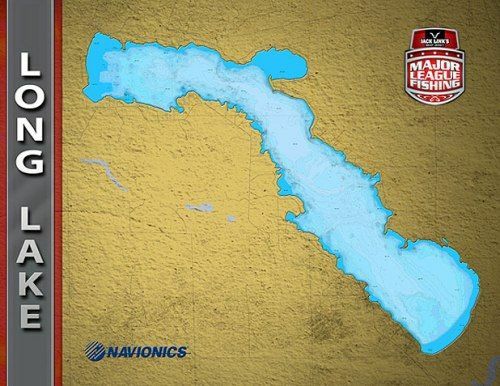 His answers, as he scanned a map of Long Lake for the first time, fully illustrate the dilemma that MLF anglers have faced at this event. They have no idea where they are fishing until they pull into the boat ramp parking lot. The first question was this: Any similarities between Long and Hubbard Lake (site of the Elimination Round)? "Oh, without a doubt," said Evers as his eyes scanned the map. "I think the lakes are going to fish similar. I don't know how many miles apart they are as the crow flies but looking at the maps, (there are some similar things)." But as he continued looking at the map, Evers' brow furrowed a bit. "Well, I guess this lake's a lot shallower," he said. "But I would have to (still) think that it's going to be similar. I don't know; there may be more grass in this lake because it is shallower. It's got some nice flats, some nice shoals on it." But then Evers added this thought, as if to remind himself of the day's most important truth. "Anytime you're going to a new body of water, a bass is a bass," said Evers. "Whether we're fishing out on Lake Huron or over there or over here, (we are still after bass). "It's all just (finding the) pieces of the puzzle that will help you (on that) day. "Sensing an opportunity to dive more into the thoughts of MLF anglers as they encountered the new wrinkles of this event, I pressed Evers with a few more questions. Like my next question of what was he specifically looking for as he scanned his electronics? "Just really how the lake lays," said Evers. "Thinking about how the wind is going to be hitting everything today. Seeing if there is anything peculiar thing about it (Long Lake), anything that really sticks out in my mind." With that, he pointed at the map. "That looks really neat over there," said Evers. "(I'm looking for things like) pinch points, points, humps … just different things. "You know, there's a lot of information here on the Navionics chip – rock piles, docks – (stuff) that just tells you a little bit about the lake. I try to look at it as much as I possibly can." 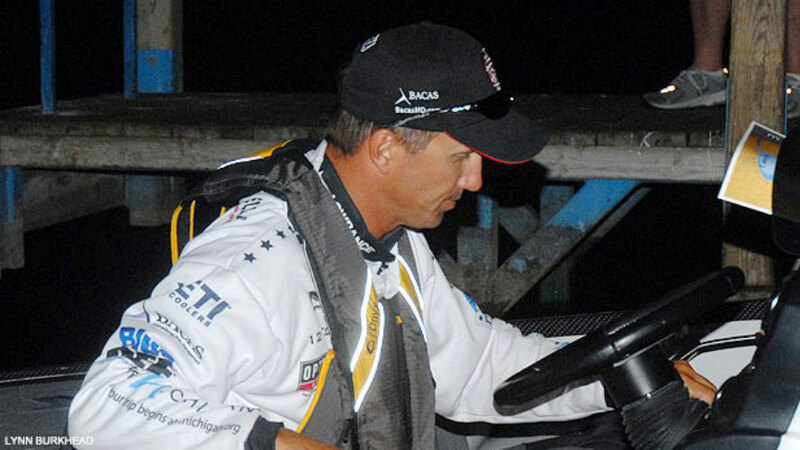 All of that was helping Evers formulate a mental game plan - even if it was mere minutes before the anglers launched onto the water - about how he wanted to attack the lake and look for fish. But just finding and catching fish isn't all that Evers is up against and he knows it. There also is the element of fishing against the other competitors, including Michigan man Kevin VanDam who put on a virtual clinic during the Elimination Round by demonstrating how to vacuum up a lake's smallmouth bass. Which led to the next question that I posed to Evers: Is it you against the fish or you against the fishermen? "A little bit of both," he said. "Everybody (that is here) at this point, they've got them dialed in pretty good." Because of that, Evers knows that he has to make some good initial decisions, adjust and adapt quickly, and "get out there and catch them." If he can do that, the Oklahoma pro will be in position to add some Michigan MLF hardware to the title that he won last year on Florida's storm-tossed Lake Istokpoga. "My whole goal (today) is to get out there and get some bites right off the bat," said Evers. "Then I'll start trying to put some weight in the boat. "You just never want to be behind the eight ball (in this format)." With clouds and some wind, Evers says that it may take him a while to figure things out, since it will be difficult to see fish. Even so, E-2 knows that this Sudden Death day is a track meet to the finish line, a survival round of the fittest MLF pros. Unlike the Elimination Round at Hubbard when he had the luxury of figuring things out in the first period, stacking up some weight and fine tuning things in the second period, and finishing things off in the third period, this day at Long Lake is a totally different animal. "Today, you've got to catch them right off the bat and make it happen," smiled Evers. "There's no ifs, ands, or buts about it." And with that, Evers smiled, nodded at me, and politely turned to go about his business of making some Major League Fishing history.